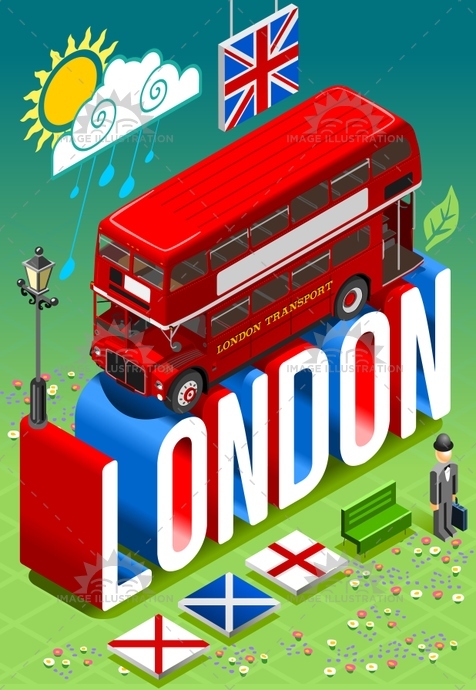 Stock product - detailed vector illustration - Isometric Postcard Collection - London Bus - created by Aurielaki. Image formats EPS AI JPG. SKU: London-Bus-Postcard-Isometric-AurielAki. Category: Public Transport Vehicles. Tags: 3d, axe, bowler, britain, capital, decker, double, england, europe, flag, flat, gentleman, great, hat, illustration, infographic, isometric, jack, kingdom, london, postcard, template, touristic, travel, trendy, union, united, vector, weather, web.